Aleen Aked, The Ringling Museum Courtyard. Oil on board, 18 by 24 inches. Aleen Aked was an important figure in the artistic life of Sarasota in the 1930’s. Born in Yorkshire, England, Aked moved to Canada in 1910 and at age fourteen won a scholarship to Arthur Lismer’s College of Art in Ontario. From 1929 to 1944 Aked spent winters in Sarasota and summers back in Ontario. She exhibited regularly with the Sarasota Art Association; elected president in 1942. She was also an accomplished golfer. Education: Ringling School of Art; with Abbott Graves and Sydney March; Ontario College of Art, Toronto, Canada with a group of seven members, including Arthur Lismer, J.E.H. MacDonald, F.H. Varley, J.N. Beatty, Emannel Hahn, George Reid (Flavell Life Scholarship). Membership: Sarasota Art Association, president, 1942, director, 1946; Florida Federation of Art; Southern States Art League; Canadian National Exhibition; Royal Canadian Academy; Ontario Society of Artists. 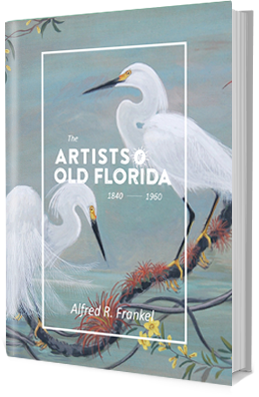 Exhibits: Ringling Museum of Art, best landscape, 1935; Florida Federation of Art, 11th Annual Exhibition, St. Augustine, December 2-5, 1937, Cedar Trees, Bermuda, Court House Tower, Sarasota; Ringling Museum, most popular painting, 1938; Sarasota Art Association, Ringling Museum of Art, February 1939; Sarasota Art Association, Florida Theater building, March-April 1939, oil, Under the Banyan Tree; Sarasota Art Association, Cain Building, Orange Avenue, Art in Our Town, December 1939; Sarasota Art Association, January 1940, 1st one woman show; New York Public Library, January 15-February 15, 1940, two woman exhibit, with Lois Bartlett Tracy, Florida scenes; Sarasota Art Association, 221 South Palm Avenue, Members Exhibit, January 1946, oils, Sunny Myakka, Prickly Pear Cactus; Allied Artists of America; Royal Canadian Academy; Flavell Life Scholarship from the Ontario College of Art; Listed in Artists in Canada and Who’s Who in American Art.